Some Bilberry Is Not Authentic! Make sure the bilberry supplement you take passed our quality review and is right for you! Bilberry may help improve vision and have other health benefits, but some bilberry supplements don't contain real, concentrated, European bilberry extract -- the type used in most clinical studies. Its easy to be fooled with bilberry and you could end up with a supplement made from less expensive plants, or not concentrated enough to provide meaningful amounts of bilberry's unique mix of anthocyanoside compounds. How do you choose the best bilberry supplement? 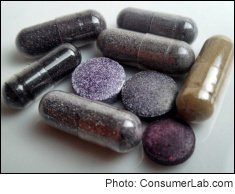 ConsumerLab.com purchased and rigorously tested many popular brands of bilberry supplements, holding them to the highest standards of authenticity, purity, and proper pill performance. We found out what was really in these bottles -- only 75% of the products passed testing. One supplement contained only 62% of its promised bilberry compounds and another failed to properly break apart fast enough in disintegration testing. To help you get the best price and value, ConsumerLab.com also compared bilberry supplements on cost. We found that you could spend as much as 4 times what you need to spend to get same amount of high-quality bilberry.